Osso Buco Milanese | Jake & Sam -- Let's Cook! Soon after I met Brad thirty-six and a half years ago, I cooked him osso buco for his birthday and he remarked,”This is the best thing I’ve ever eaten.” So I’ve continued to make it for him every birthday since, and he still reports that there is no better dish in the world. Then, when I had Fête Accomplie, my gourmet carry-out and catering business in Washington D.C. in the 80’s, a woman in the line of 30 customers declared loudly, “I’m Italian and I’ve never had better osso buco,” to which the other customers said, “What’s osso buco? I want it!” From then on there was a constant demand. I do think it’s a wonderful dish and that simple cooking is best: No onion, no carrots, no celery in the sauce. Just the pure flavor of tomatoes and white wine and the incredible essences that pour out of the veal and the marrow. 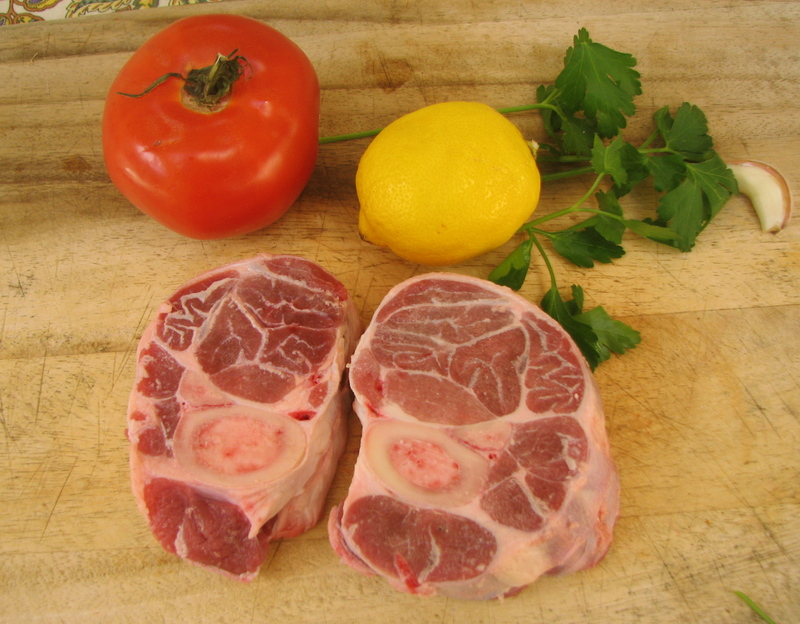 You must have the right cut of veal shank: Not those 3″ high solid bones with little marrow and less meat, but slices about 1 to1-1/2 inches thick with large marrow-filled bones and plenty of tender pale meat that falls off the bone and becomes slightly gelatinous when cooked. Osso buco means hollow bone and within the hollow bone is marrow and without it the purpose and perfection of the dish is sadly reduced. So, If the idea of eating this succulent morsel turns you off, then osso buco is probably not for you. I like to serve it with the traditional risotto Milanese and gremolata, a chopped up mixture of lemon, garlic and parsley. Steamed or sauteed zucchini is a nice accompaniment. It’s certainly a dish worthy of a special occasion. Heat the butter in a sturdy pan over fairly high heat and brown the veal on each side for 2 minutes. Pour over the wine and let it bubble and reduce by half. Chop the tomatoes finely – I pulse them a few times in the food processor – and add them to the pan. You may not need the full can, they should barely cover the veal. Add the chopped clove of garlic and salt and pepper. When it comes to the boil, turn down the heat, cover the pan, and let the veal simmer gently for 40 minutes. Carefully turn the slices over, making sure you keep the veal and its marrow intact, cover the pan again, and continue to simmer. Check after 20 minutes. The meat should show little resistance when pierced with a fork and the sauce should be thick – it may need another ten minutes or so with the lid off to further reduce the sauce. The meat won’t mind. For the risotto, cook the onion in the butter until softened, about five minutes. Add the rice to the pan and stir it around for a good minute or two to make sure the rice is impregnated with the butter. Meantime warm the stock, add the saffron to it with a half-teaspoon of salt (if the stock isn’t salted) and add it to the rice, stirring. As soon as it comes to the boil, cover the pan tightly, turn it down to the lowest possible heat, and cook for exactly 17 minutes. Fluff it with a fork – it should be perfectly cooked but can rest, covered, for a few extra minutes. For the gremolata, combine the parsley, garlic and lemon rind. 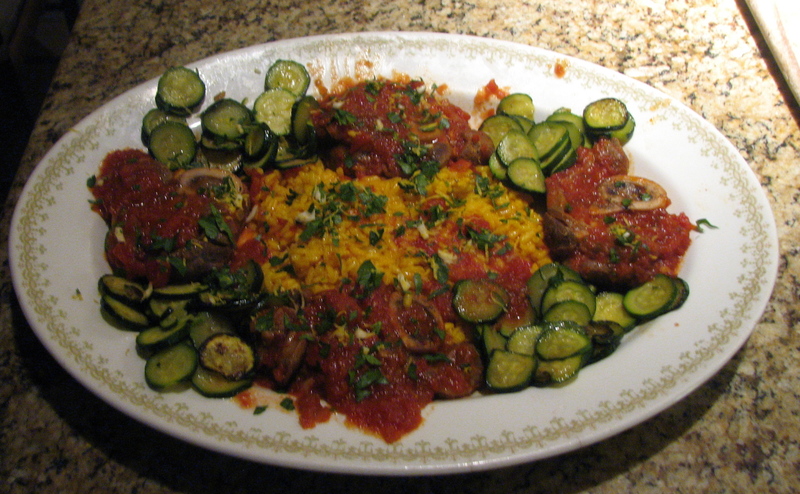 For the optional zucchini, cut it into either rounds or batons and steam it until just tender. Or, if you prefer, you can saute it in a little butter. Assemble the dish: Mound the rice in the center of a large oval platter. Surround it with the veal, placing the zucchini in between. Spoon over the sauce, sprinkle with the gremolata and be ready to have one of the best things you’ve ever eaten. In all these years I have never made Osso Buco and what was I missing!! Oh my, I see why Brad likes to request this for his birthday! Other than having to request a good cut from the butcher the dish isn’t that hard to make and so delicious. I thought about making it again for my husband’s birthday but my birthday is so much sooner.